Just finished a wonderful week in Cortina. The boys were great, Thanks to the children they met and the staff absolutely professional. See you soon and thank you all for giving them a wonderful week of good memories. Congratulations on your organization, truly impeccable and very professional! Over the last 5 years I have enrolled my children in various camps both in Italy and abroad and I have to note that from an organizational and quality point of view the AC Milan camp was the best. I would like to express our greatest gratitude and satisfaction for the experience lived by F. in the week spent in Cortina d’Ampezzo. He had a lot of fun and was able to get by himself (despite being the first time away from his parents), as well as helping his younger roommates. We found him happy and serene and of this I can only recognize all the credit to you. sincere thanks for the wonderful week that my sons A. and M. have spent in Gallio from the 15th to the 21st of July. For them it was the first time they took part in an AC Milan camp and they had a great time: beautiful location, very well prepared staff who followed them both on and off the pitch and perfect organization in every detail. Good evening, these few lines to express my appreciation for the camp in Asiago Mountain Plateau – Gallio from 22/7 to 28/7, from which we have just returned. My son G. had a lot of fun and it was great, despite some initial emotional difficulties due to his first experience alone. All the staff behaved excellently, he slowly melted and returned with a beautiful smile. A specific plaudit for Andrea Boscolo, the goalkeeper’s trainer, really very good at explaining to the boys: it was a pleasure to listen to him also for us parents. If possible, we will be happy to come back next year. I would like to thank all the staff for their commitment to the AC Milan Camp of Gallio. Vincent is still a little kid – but these two weeks have done him so well. I would like to thank all the coaches of whom Vincent has always spoken to me with such respect. Above all, I would like to thank Walter De Vecchi, whom I was able to observe with great joy when he was training the boys. He, besides being a great coach, is also a father for the boys. It is a pleasure to observe it. If Vincent in 2019 still wanted to play football (which would make me very happy) then we’ll definitely see you at Gallio. My son S. bacon has adored the camp so much- thank you for everything! We will see again next year certamente! An entire staff which is qualified and organized in a perfect way ….. An unforgettable experience !!! We will certainly come back! ! ! Great ending to a beautiful experience. L. is thrilled. He will take away this latest wonderful memory that will last for a lifetime. Congratulations to everyone. F. is very happy. It’s a way for a “little man” to grow up … Thanks to all of you for the organization and the dedication given. Perfect organization, great professionalism by all the staff (none excluded). My son had a very positive experience during the Cortina week from 25/6 to 1/7. A round of applause to all without exception and we will most likely come back next year too. Best wishes for the rest of the season! First of all, I would like to thank you for your part in making the AC Milan Camp such a success. My son A. attended the week of 2 July in Cortina d’Ampezzo and had an amazing time. Everything, from the training to the food and accommodations were top notch. His only regret was that he had to leave. I wanted to tell you that for d. It was a really great experience. He had lots of fun and also learned a lot. The coaches are really good as is everyone who looks after the boys. For my son, it was the first year not only of camp, but also of a holiday on his own. Despite some missing us, it was a lot of fun. Ever since he came home, he keeps doing the exercises that Eranio taught him and talks about the camp. It was a wonderful football and life experience. He played football and made friends with kids who came from all over the world. Thanks to Stefano Eranio, Serghei, Alessandro, Chiara and all the staff. We’ll see you again next year. My sons F. and G., age 10 and 15, came back yesterday after a week in Asiago. There are no words to describe the professionalism and organization and the exceptional staff. The boys are waiting for next year with great enthusiasm and to repeat this wonderful experience! Many thanks to all! My son F. took part in the camp in Asiago. It was an unforgettable experience. He has made new friends and the staff is very qualified. We thank you for the great experience. My son C. came back last Saturday,22/07, from the Asiago camp. It was his first camp experience and holiday on his own. A little bit of homesickness, but he had a lot of fun and he would certainly want to return again next year. Beautiful location, excellent, qualified and well-prepared staff and top managerial organization. A great experience that we will certainly repeat! We want to thank all the staff for the wonderful experience last week in Asiago. L. and F. did really well. They learned and enjoyed themselves in an “incredible” context. It is not every day one can come into contact with peers from 13 different countries. On top of that, they were always “looked after”, both on the field and during recreational activities. Really, congratulations to everyone! I’m A.’s dad and my son was very happy. Already he can not wait to come back next year. Perfect organization! Exceptional location! Beautiful hotel! Fantastic extra football activities! My son had a lot of fun. He has met so many new people and kids and every day he tells us everything he has done. As parents, we must say we were truly not at all worried. Being in touch with Antonio every evening and hearing him always more calm and content gave us peace and tranquility as well. See you next year in the ever beautiful setting of Asiago …………. Now back in New York after some time around Italy, winding up in Rapallo. This just to say that our boys had a remarkable time, even better than the previous years, they say. P. — and maybe his brothers too — hopes to return for two weeks next year! Thanks to the staff. Hoping to see you next year! G. took part in the Jesolo Camp from July 16th to 22nd and I must say that he had a wonderful experience !!! We found a superb staff supported by great precise organization down to the last detail !!! Very good and super-prepared coaches…who really made the the boys work!!! A special thanks to the goalkeepers’ preparation … they really made him sweat and challenge himself !!! A camp that I recommend to everyone ….. and above all to do again !! First of all, I would like to express my sincere thanks for the wonderful experience you have given us through the Lignano Sabbiadoro Summer Camp held from 23 to 29 July this year. My son has just finished the happy experience of the camp in Lignano. 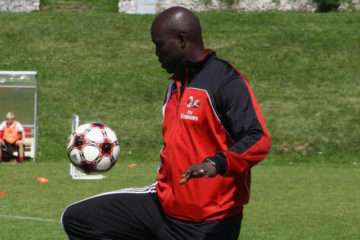 It was one that has thrilled him and left him with the joy of having made new friends and learned a lot from the professionalism and enthusiasm of the coaches. Excellent organization. Thanks and we hope to be there next year. Hi. My son took part in your camp in Lignano and I must say that it was really a success … He’ll certainly come back next year. I would like to thank you for the organization at the Milan Junior Camp in Lignano Sabbiadoro. My son G. was really very happy and for him it was the best holiday ever. Thanks also to the coaches who were very good. They were fun and made everything an unforgettable holiday. As a parent, this makes us very happy. A fantastic week, my son L… has already told me he wants to go back next year!!!!! Organization was nothing short of amazing guys and I wanted to thank everybody […] Stefano Eranio, Greta, Chiara and all the staff you’re awesome!!!!!!!! Thanks also to Sporteventi and Mr Marchionni!!!!! This wonderful adventure for the kids only finished a few days ago and I think they’re already missing it. I can’t praise this wonderful organization highly enough, these guys are all fantastic with no exceptions, the amazing atmosphere and the air we breathed, not just in the mountains but AC Milan too. Being a fan is really special now… Thank you and well done to everyone. […] I’m Michele, P…’s Dad . […] we just wanted to thank you and everyone else for the wonderful experience you have given us! Almost a week later E… is still telling us stories (some more entertaining than others) and his eyes are really lit up. Not to mention the ball you gave him that he takes everywhere! More than just football it was an amazing life experience. Many compliments to all of you for the wonderful organization, your commitment and the joy and patience you showed the children! They say that proof of well-run education is happy children… I think I saw a lot of happy children …. See you next year …. I just wanted to write and say thank you to you and all the staff at Sporteventi who made the AC Milan Camp in Cortina from the 3 July 2016 such a success. My two boys, S. and M. returned home to Scotland last night and were so excited to tell me all about it! They have had a wonderful experience and mentioned great coaching, meeting new friends and good food as their highlights! When I asked them if they would like to go again they both said – absolutely yes! Please pass my thanks on to all the staff who made the week such a memorable experience for them both. A wonderful experience in sports and friendship! Filippo is looking forward to coming back next year! Good job, everyone! From the guys to the organization. An awesome group! Thanks for everything! Fun and fantastic camp! Cultural exchange between young people from all over the world! Perfect staff and Pierino Prati was welcoming to the children, one look from him gave everyone confidence! Great week! Many thanks for your time and consideration, and congratulations on running such an excellent football camp. My son has had nothing but delightful things to say about the camp and your staff. Wonderful experience even for the youngest, highly respected staff and always available, already booked for next year. I’m writing on behalf L….’s family to thank all the staff for the incredible experience that my grandson had last week in Jesolo. The atmosphere of camaraderie and healthy sportsmanship contributes positively to building children’s characters. Well done to you and to the entire organization. We hope there is a … next year. Your organization is impeccable. Another wonderful experience for my son. My son has been asking to be allowed to take part in this camp for several years and we finally did it! It’s not a cheap experience … But I can assure you that it’s worth every penny! The professionalism of the whole team stood out from the start. All very organized, the kids were never left on their own for even a minute. From dawn to dusk they were busy with training and group games and there was also some time for leisure and culture. “Last but not least” the fantastic party for the parents with music, prosecco, sweets, films and awards, all demonstrating the commitment of trained and professional people. I wanted to drop you a line to say thank you for the excellent organization of the AC Milan Camp in Cortina. My son A… who attended last week had SUCH A LOT of fun. Well done to the staff for their professionalism, commitment, organization and constant kindness to the children. Your organization gives a super image of football which unfortunately is often not the case. Well done! A … was delighted when he came home. We returned on Saturday, R … was in the 1st group at Lignano Sabbiadoro and it’s been a wonderful experience, definitely to be repeated another year. […] I’m R…’s Mum. I haven’t yet had chance to get in touch and thank you for the week at the AC Milan Camp that finished recently. I left my son on the Sunday – with no mobile phone or anything – and as soon as we saw each other again the first thing he said to me was thank you for the best week of my life, please can I come again next year. So thank you. And we hope to see you again next year. Wonderful experience for my son Nicolò !!! He said that next year he will repeat the experience for sure!!! Many Thanks to the coaching staff of Jesolo !!! You are fantastic !!! Simply amazing !!!!!!! Great organization !! My son is thrilled! Wonderful experience! Absolutely to be repeated the next year! The AC Milan Camp of Cortina d’Ampezzo is absolutely outstanding! It is a memorable experience to me. The days spent at the camp were not only rich of tournaments and trainings, but there were also many other activities in the unique beauty of the Dolomites Alps. That camp was even more exciting thanks to the staff of coaches truly competent and smart. The AC Milan Camp is the perfect getaway for a boy who likes to have fun and be with his peers sharing the passion for football / soccer. 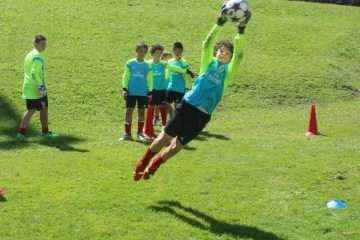 Good morning Mrs. Margherita, it’s Tommaso Azzali’s father writing; Tommaso attended the AC Milan Academy camp of Cortina d’Ampezzo last week; I would like to praise with this message the wonderful organization and professionalism of the staff of the camp. I would like to thank in particular the AC Milan Supervisors […] and Filippo Galli: they are absolutely amazing! 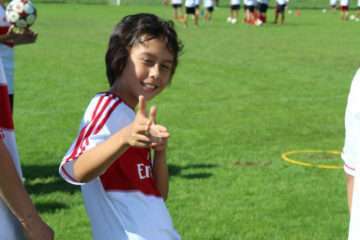 Dear Francesca, I would like to thank you for everything: my son at AC Milan Camp Cortina d’Ampezzo had the time of his life, he worked hard and he learned a lot. The AC Milan Supervisors Mr Eranio […] were great, but all the staff was commendable because of attention to details, empathy with the kids and technical competence. We had a great week and I am pleased to emphasize that. Congratulations indeed to AC Milan, I think we will repeat the experience, sooner or later. In the meantime, my best regards from Rome. Dear Michele, Dmitrij says that he liked very much the organization of the AC Milan camp, both accommodation and training. For Dmitrij the most relevant thing was that his son Grigory got an good experience of the Italian soccer, communicated with other children of different countries and was very pleased about the camp. The next year we will surely join the camp again. About my own opinion, I would like to thank the organization because we could easily communicate with the coaching staff of the camp! Good luck and see you soon! Dear Margherita, we would like to thank you again for the time that my son spent in Asiago during the AC Milan camp; as in 2013, in 2014 your organization has proven to be what a parent wants for his child, an organization that takes care of every aspect; in addition to the fun I have directly experienced the care in preparing every aspect for the success of the camp. I want to underling the professionalism of the all the staff, also in terms of educational and psychological approach; all the members of the staff inject enthusiasm to the participants and impart them the meaning of being together and the value of fair-play: this his is for all the participants a masterpiece for an healthy growth. I am the father of Alessandro Panzerini. In these few lines, I wanted to express, also on behalf of my son, my appreciation for the wonderful week that we enjoyed at the camp of Vittorio Veneto 2012. From the start I had no doubt about the competence and professional approach of all the staff even of those who work off the limelight, as you are. The kindness and understanding of you all will always be remembered as it was absolutely unexpected. It has been an exciting experience that Alexander and I were glad to have experienced. We will come to Vittorio Veneto again for sure next year and during this year we will promote in our neighborhood the camp organized by Sporteventi. Best greetings also to the nice barmaids of the bar next to the field. Hi, I’m the father of Giacomo (2002). Giacomo took part in the Junior camp of Vittorio Veneto in the week from 22nd to 28th July. I wanted to thank you for the professional and kind approach in welcoming the children that we gave you in custody. The sports facilities were amazing, the hotel where they stayed was excellent. But above all, the organization, the professional method and human approach were absolutely top. For Giacomo it was an important experience for its growth as a young player but also for the educational experience of sharing that he did experienced with the other children. Thank you, because one could see that you were interested in each child / youngster and your willingness to answer even the most demanding questions and the desires to know of us the parents. I wanted to thank you, your father and Sporteventi all together for the camp of Jesolo! Filippo came back excited for the second time, perhaps even happier this year! He put into practice his talent for speaking English with the Russian boys with whom he became close friend….. and played football, his other great love, and having fun. Special thanks to Luca, Fabrizio, Giorgio, Marco and Chiara who were excellent, as always, but all the Misters (says Filippo) are fabulous, as spectacular is Pierino! Best Regards and see you next year…! I would like to thank you for your eagerness in answering the various information I required in time, also I wanted to ask you to extend our gratitude to all the staff who participated in the AC Milan week of the Cavalese camp. I found it fabulous the great fellowship among all the staff, the team spirit, the generous approach with the boys: to have created such a climate is already and surely a victory. I also appreciated the seriousness in carrying out the activities, the awareness of not making the children feel under examination, by conveying to them the concept that the result counts up to a certain point, and that they have a long way to go. You have all my consideration and appreciation as well as my encouragement to continue their outstanding work. I wish to express a special greeting to PIERINO PRATI, a person so open and ready to help. For my family as well as being a champion on the soccer field he has proved to be a champion of life. Thanks, see you soon. I am Matteo Azzali father of Tommaso, who last week took part in the camp of Cortina, exciting experience not only in terms of football games, but also from the point of view of his growth in interpersonal relationships. See you next year and again Forza AC Milan. With this email we renew our warm greetings but mainly a great thank from the bottom of our hearts for having organized also this year a Soccer Camp at the highest technical level in a great atmosphere of playful football and appreciated by children and adults likewise. To give you an idea Filippo has classified the camp from 0 to 10 = 11! Unfortunately the week flew off but will remain another wonderful memory for him and us parents who will try to replicate next year, maybe for a longer period if possible. If you let me, I would like to give you a suggestion: it would be just as beautiful and I believe also highly appreciated if you could organize such an event in Miami too in the future, maybe in the winter time when the temperature is very mild and with plenty of sun. On behalf of Jakob Ambrozic thanks again to you and your team for organizing the summer AC Milan camps in such a wonderful way! Jakob said that gained football experiences under the supervision of AC Milan trainers are excellent. The many small details that you arranged for Jakob, beautiful AC Milan Academy Camp goalkeepers kit, location, outstanding food, and not to mention your hospitality made it not only an interesting and important, but a very pleasant AC Milan Camp and I hope that next year Jakob will participate summer AC Milan camp. For some inexplicable logic, we have changed our internet service provider here at home, so are without internet service for the next 2-3 days. I am sure David will send his personnal thanks once we have a connection again, I just wanted to send my own thankyou. We arrived home last night, David was and still is absolutely buzzing, we got home 8,15 last night, I ended up on the local pitch until 10pm. Was a great recommendation from you to go to Vittorio this year, David insists on a return next year (although you can tell Othello I have a lot of work to do to convince him to turn up in a Kilt), he absolutely loved it. Please extend my thanks to Mr Pratti, to Othello and his team of coaches, to your father and your wife for there impecable organistation, and of course yourself, not least for the recommendation in the first place. After a tough start due to his homesickness, my son did indeed have a wonderful time. He is a somewhat shy 11 year old boy and this was his first time away from his family. I arrived at the camp on Friday to watch him, and it was clear that that he was enjoying himself immensely as were all the boys. Compliments to your coaching staff […] I had expected that the coaches would be brilliant at coaching football, and indeed they were. But I was also impressed and indeed touched with how they genuinely cared for the children. Even on the last match on the last day, Luigi Maldera was still on the pitch consoling a young boy who was upset for having let in a goal. In short, your camp deserves the highest rating. It was highly professional, loads of fun, and very well organised. I would also add that the food was great, but this is Italy, so that’s no surprise. Phillip learned a lot about football, and he has switched allegiance from Juventus to AC Milan! I would happy to provide a reference to any parents who were considering sending their children to your camp or you can use any of the above on your website. i just wanted to send a note of thanks for all your organization last week. I had a great time and really enjoyed it and hope i am able to come to another camp in future. Please also thank Coach Prati […] and all the rest of the coaches for giving me a fantastic week. […] Queria tomar esta oportunidad para darte las gracias por todo la semana pasada. Una vez cambiado de grupo, Roberto tuvo una semana buenisima. Espero oir pronto de ti para posiblemente regresar en octubre a milan para el AC Milan junior camp day. Otra vez, gracias por todo. P.s. Giorgio fue una ayuda increible. Es un tremendo asset para AC Milan Academy Junior Camps. I would like to thank you once again for your help in organization of Anton’s stay at the camp. He’s enjoyed it and hopes to join you next year! Just to let you know that Javarn had a wonderful time at AC Milan. Javarn, would like to say thank you to all the staff at the camp for their hard work, especially those who stayed at the hotel with him. I would like to say that your staff were wonderful and were always happy to answer any question when possible. Words cannot describe the quality of your staff this was more than I excepted, what a WONDERFUL TEAM. Please pass on my thanks to the guy that registered us, I am sorry but I cannot remember his name. What a great and helpful person he is. The lady on camp what a true mother she was to all the boys. Once again THANKS for your time and that of your staffs. Thank you for the picture, I am very proud of my son. Emmanuel enjoyed his two weeks in Milan AC and does not stop taking about the great time he had there. I hope we will be able to join again next year. Nice weather, very good fields and a lot of others boys how also love football, together with the opportunity to use my English. Thank you to all the other boys and all the staff/coaches. It has been the best summer ever. My parents also enjoined the very nice Italian city. Both me and my parents hope to be back next year. Thanks for another beautiful experience Soccer Camps International and especially AC Milan Academy Junior Camp in Vittorio Veneto. See you next year. Thanks for a great camp. Carter had a lot of fun. Thanks. I want to inform you that Orfeas had a great time last week at the MJC in Jesolo. I just want to thank you for all your help and cooperation for another great 2008 season and I am looking forward to another great year in 2009. You and your staff have done an incredible job and my clients were very happy, I will keep you updated with feedback I should receive during September! long time I just arrive from 2 days from Lebanon really we remember every days we spend in Italy such a beautiful place, it was a nice experience. I would like to say thank you again and really we missed you all. i just see the pictures very nice all. I am writing to thank everyone at Sporteventi for making my son Joshua’s week at the Vittorio Veneto junior camp such a wonderful experience. He had a truly fantastic time and we thank the staff for all the care and attention they gave Joshua. It was an experience that we will always remember. Please pass on our gratitude and sincere thanks to Michele and all the staff. Joshua is very keen to come again next year! I would like to inform you that Emmanuel Antony SAINT-PIERRE and I are well arrived. Thanks for all you did to make this event memorable for my son. We will stay in touch. I wanted to write earlier but ,getting things ready for my kids back to school kept me busy. My husband and I would like to thank you for everything, my kids soccer camp at Cortina was incredible everyone at the hotel was very polite, the hotel was great, the AC Milan staff was great, […] was very nice everything very well organized, I stayed there 4 days then I came back to pick them up, so I got to meet everyone. my kids want to return next year. Thank you for a beautiful days in Medulin! See you also next years!! I’ve seen the pictures they are amazing, so beautiful and I hope the next camp I will have the occasion to go to Italy with the campers. And I would like to thank you for your management and way to deal with such big group and especially different ages is not easy to deal with them. It was really a big honor for me to deal with you Michele and I hope we can do more programs with AC MILAN JUNIOR CAMPS in the future. Our son, Neil Patterson, returned today from the AC Milan Academy Junior Soccer Camp in Jesolo. He had a marvelous experience and has come back beaming. Also, our thanks & gratitude for all the good the times and training that they’ve had during their stay. As to comments that I’ve heard from them over the phone, is that the food is very; the trainers, the organizers and the facilities are great and the place is exquisite. Again our thanks for having them these two weeks. Thank you very much for your kind hospitality this past week in Vittorio Veneto. The boys, Darren, Dennis and I had a fantastic week. Many thanks once again for all your help and I look forward to speaking with you again soon. I wish to thank you for the marvellous fun that Kavous and his team mates are experiencing in Vittorio Veneto; our nephew’s enthusiastic comments – the delicious food, the intense and energetic practicing, being exhausted but delighted at the end of the day – give us one more reason to be “proud to be Italian”. Anche a Suo padre un cordialissimo saluto. “Michele, I cannot express how happy we all are the way the camp has gone. We saw the pictures and were amazed at the beauty of the place. The kids are all very happy with the camp and some of the parents has called to thank us for arranging such a wonderful camp. We deeply appreciate all you efforts and cooperation in making this camp a successful one. Thank you very much for accommodating them inspite of the differences in culture and discipline. Once again, please accept our deep appreciation and gratitude for helping us make this camp a success. We look forward to do it again next year”.